If we aren’t careful, our culture can take the reigns and make sure our Christmases are chock full of candy, cookies, socials galore, loads of presents to buy and tons of moolah going out the window. I don’t know about you, but this is not really the kind of Christmas I usually intend to have. Although it may sound fun, in the end I’m often just tired, weary, on a sugar-high and wondering where the meaning of it all was (as well as where my money went). Thankfully I now know it IS possible to have a Christmas that is full of meaning–and full of value–for you and your loved ones. You simply need to plan it intentionally rather than let everyone else decide for you what’s important. 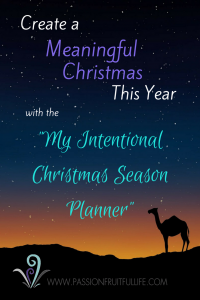 Last year I created the My Intentional Christmas Planner of ____________ (you fill in the blank with your top value) to help me and my readers imagine and create a Christmas that is full of meaning…. and less of the rushing. I had had too many Christmases before that felt “light and fluffy” rather than satisfying, and now that my son was one, I wanted to begin to make a more meaningful Christmas happen. Although I simply took baby-steps in that direction last year, I know I’m heading in the right direction, and I have some great meaningful memories to savour from last Christmas. Now that I’ve revised the planner a bit and already worked through it myself this year, I’m exciting about the new ideas I’ve planned, and I’m happy about the meaning we are building into the holiday– for me, it’s about celebrating the gift of Jesus with joy, fun, relaxation, and wonder. I suggest that if you’d like to begin to create a more meaningful Christmas as well, it’s important to take stock of what you really value, brainstorm ideas that line up with those values and then create a step-by-step plan to help you implement them. 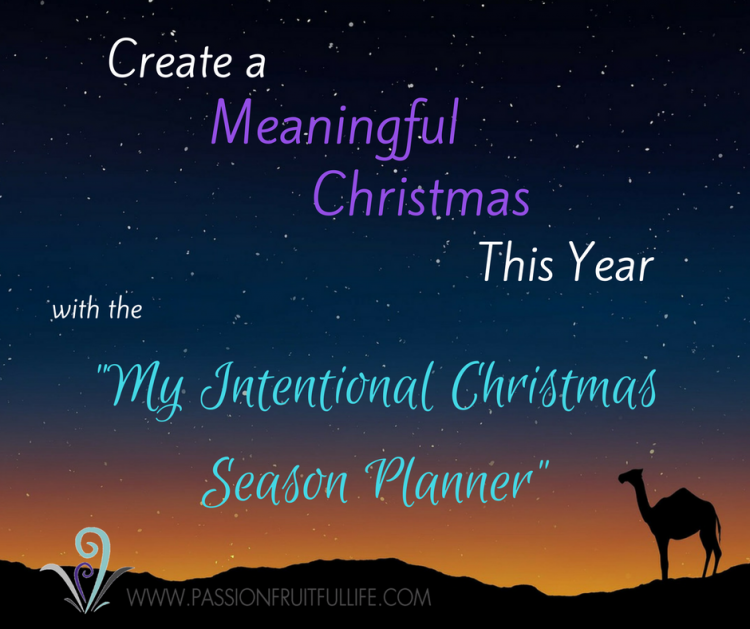 I believe my planner will help you do that, helping you creating a meaningful Christmas that you and your loved ones can enjoy! My chosen values for this Christmas season (as the planner will help you do, as well) are: meaning, family, giving, physical health, and simplicity. meaning and family: sing “Happy Birthday, Jesus” with the fam before digging into the presents. We did this last year and it was a hit with everyone, especially the little guy. Check out this fun song here. I’ll also add some other carols this year, too, since my son really enjoys singing and playing his toy guitar and/or drums (we’ll have to do “Drummer Boy” of course). Anyways, those are some of my hopes for this year… I’ve got a few more up my sleeve, too. I’ve gotten started on a bunch of the ideas, and am pleased and grateful so far with how it’s going. I really believe this year is going to be even more meaningful than the last and I’d like that for you, too. 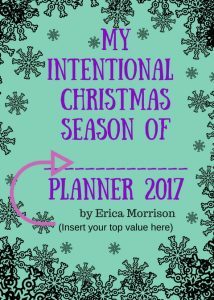 Check out the My Intentional Season of _________ Planner 2017 (only $2.99 Canadian this year) and I hope your intentional Christmas season will bring some great memories and more peaceful feelings, as well!